Two years back, thrash legends Overkill put out “Ironbound”, one of the best metal albums released in recent times, and if anyone needed proof of the fact that the band is as strong as ever, Ironbound was it. 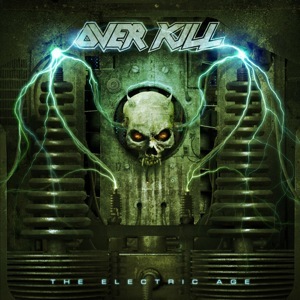 On the back of that tremendously successful album and an absolutely fantastic world tour which swept all attendees off their feet, Overkill are back with their sixteenth studio album “The Electric Age”, an album I’ve been anticipating with baited breath. After such an incredible album, it must have been a hard task to follow it up, and now it’s time for me to find out whether the band has successfully done so. From the outset, it’s clear to me that they have adopted a similar approach to songwriting for this one as they did on Ironbound. The result is an album that truly sounds like the next step forward in the band’s musicianship, but closely resembles its predecessor, which isn’t a bad thing at all. In fact, that could turn out to be the best thing about this album, because if you’re a thrash fan, it’s more than likely that you loved Ironbound. The band’s sound on The Electric Age will form a vice-like grip on the minds of thrash fans right from its first note all the way to its last. D.D. Verni’s thunderous bass sound was the most notable aspect of Overkill’s sound on “Ironbound”, and thankfully, that hasn’t changed on this album. This is what places them head and shoulders above most other thrash bands, and if some of these other bands had a bass sound even half as good as D.D. Verni’s, thrash fans would be in heaven. Of course, I have maintained over the past couple of years that Bobby Blitz is currently the best thrash frontman, and this album showcases exactly why that’s true. His voice is only getting better with age, and the manner in which he pulls off these vocals is mind-boggling. These heaps of praise on Bobby and D.D are totally deserved, but not at all meant to undermine the efforts of guitarists Dave Linsk and Derek Tailer, and drummer Ron Lipnicki. They play a huge part in making this album an irresistible force. Not surprisingly, the album has its fair share of blisteringly fast tunes, but it has more musical depth than you would expect from it. That’s one area in which it’s better than Ironbound, in my opinion. It boasts of some delightfully slow, dark and melodic passages interlaced within the unabridged ferociousness of the faster segments. Even after a good number of complete listens of the album, it’s literally impossible for me to pick a favorite tune. I find every single one of them to be equally mind-blowing, and I actually think this album has a better flow from track to track as compared to Ironbound, which compels me to listen to it as one giant 50-minute piece of music. I never doubted Overkill’s ability to deliver a follow-up to an album like Ironbound, and they have vindicated my faith by coming up with “The Electric Age”, a very worthy successor. I’m sure Ironbound is still strongly etched in the minds of fans, but I certainly think the new album matches up to it, and given the time, it has the potential to be regarded as an album one step ahead of Ironbound, in every sense of the term. Overkill’s “The Electric Age” is a scorching thrashterpiece that will enhance the band’s legendary status even further, and will ensure the successful continuity of the band’s quest to infect the whole planet with headbanger whiplash. Even though we’re still in the early part of 2012, I think I’ve found my album of the year already. Do yourselves a favor, buy it right now, at this very moment.